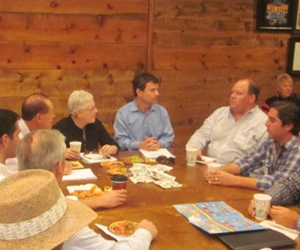 U.S. Environmental Protection Agency (EPA) Administrator Gina McCarthy visited Fresno on Wednesday, as part of a day long visit to the valley to meet with agricultural stakeholders. WAPA staff Roger Isom, Casey Creamer and Aimee Brooks attended a special meeting to discuss air quality issues at Melkonian Farms near Fresno. WAPA President Isom specifically addressed the success of “incentive programs” to address air quality issue citing the recent success of the tractor replacement program through the San Joaquin Valley Air Pollution Control District. Isom also mentioned the success that happens when the agencies work with agriculture including the success of the Conservation Management Plan (CMP) program to address PM10 emissions from agriculture that resulted in more reductions in emissions than originally proposed.